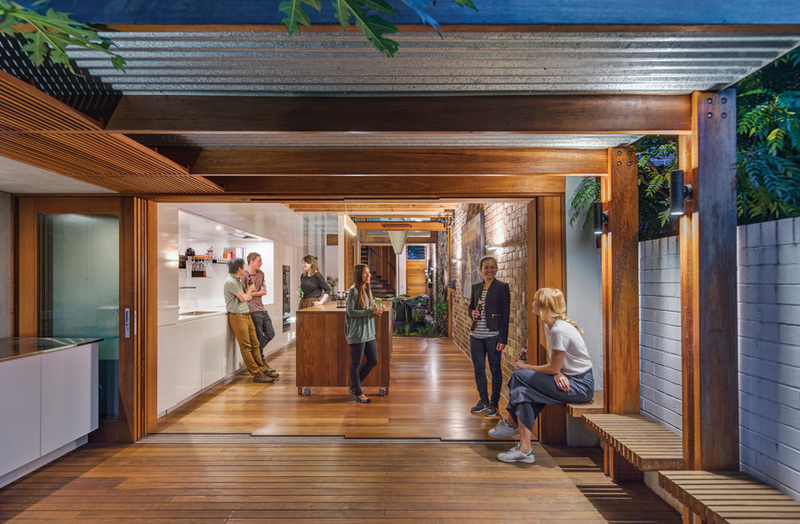 This Sydney terrace, now with fewer rooms but more usable space, is driven by creative ideas that will inspire sustainable architecture and functional living. 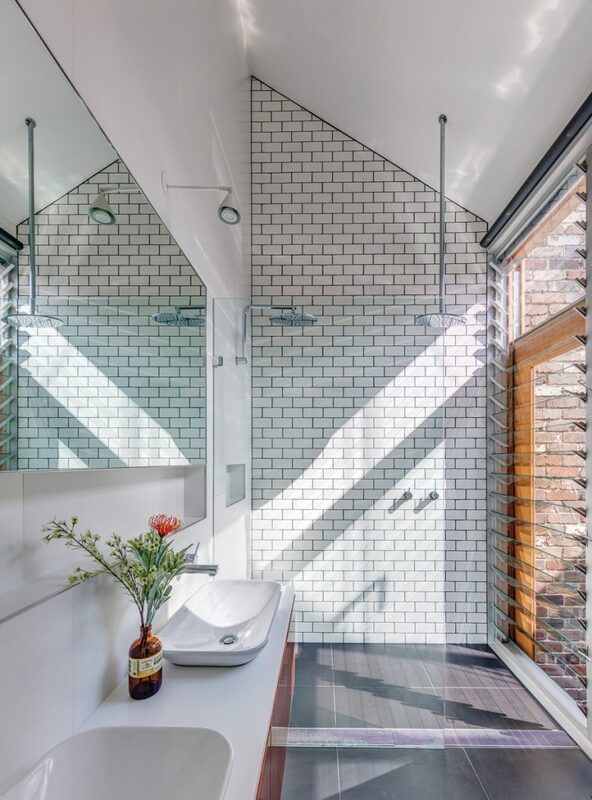 Aquas Perma Solar Firma is the home of Julie and Geoff, an environmentally conscious and socially responsible couple, and its design is driven by their passion for sustainability and desire for flexible, functional spaces. 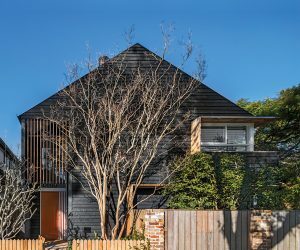 Julie and Geoff’s house in Alexandria, Sydney, was a fourbedroom, three-bathroom terrace with dark, under-utilised spaces. Now it is an open, light-filled 1.5-bedroom-and-bathroom home with all spaces used on a daily basis. “We wanted to use most of the house most of the time,” says Julie. Integrating the house and garden also proved important, as did sustainability initiatives and passive solar design. “Julie and Geoff came to us because we are experienced in creating sustainable architecture, but they pushed it to the point where we were in unexplored territory, learning along the way,” Clinton says. The plan is configured around a central garden with the living area at the front, and the kitchen and dining area is at the rear where it has a north-west aspect. The dissolution of rooms means there are no solid walls or doors downstairs; rather it is transparent from front to back with breezeway louvres, vertically hung sliding glass doors and stacking glass doors. 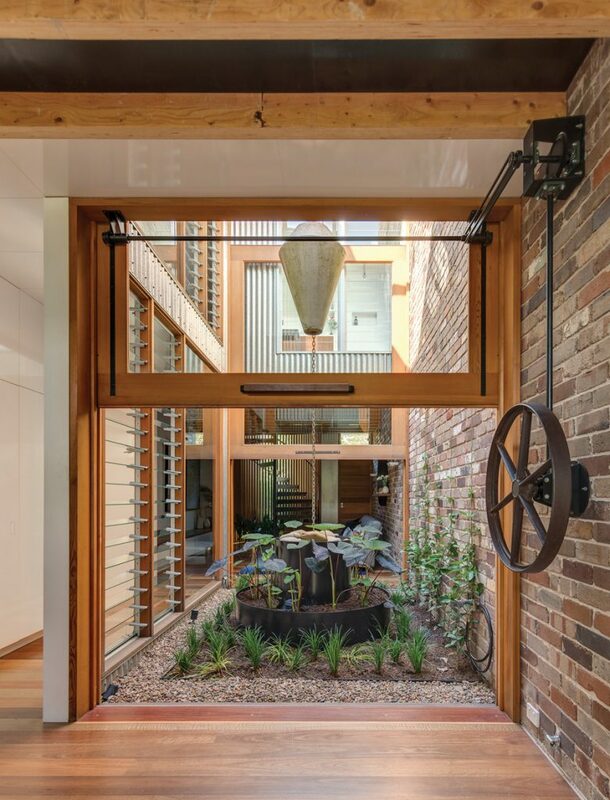 Two 250-kilogram vertical glass doors enclose the central garden with a rack-and-pinion opening system operated by a custom wheel to raise and lower the 500-kilogram counterweight. Cast in-situ by CplusC, the concrete weight is suspended on a rainchain from structural metal beams tracing the outline of the original roof. The rainchain channels water from the internal roof into a flush pit under the courtyard before it’s transported to the 5000-litre underground tank in the back garden. Julie and Geoff did away with the traditional dining table in place of a large movable kitchen island with, underneath, custom nesting tables crafted by CplusC (these can be moved and assembled in various configurations for entertaining). They also wanted frequently used kitchen items to be easily accessible, so Clinton designed and made a metal shelf that keeps essential glasses, crockery, books, herbs and spices at arm’s reach. White joinery along the kitchen and passageway conceals the laundry, powder room, fridge and pantry, and a pipe from the courtyard draws in and dispels fresh air to ventilate food cupboards. 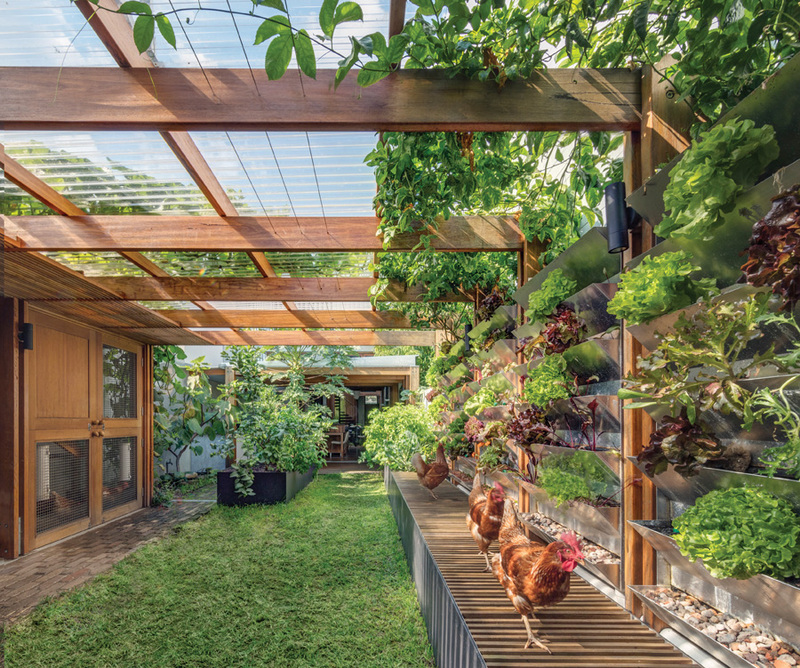 Stacking glass sliding doors open the kitchen to the covered deck and permaculture garden. An aquaponics system, designed by Steve Oatley of Sydney Organic Gardens, harvests edible fish and fertilises the vertical productive garden; box gutters collect and filter rainwater supplying the toilets, laundry and irrigation; a wicking bed minimises water wastage; and composting, a worm farm and chicken coop work in harmony with a vegetable garden. Julie and Geoff share excess eggs and vegetables with neighbours, friends and family; their next project is bee keeping. “Hopefully a house like this influences other people’s sustainability initiatives, and then perhaps you won’t have to do everything on your own plot. Maybe you have the chickens and someone else has the pumpkins and it becomes more of a selfsustaining community,” says Clinton. As a sustainability consultant Julie wanted to create a carbon neutral house. A 1.5-kilowatt solar panel system offsets current electricity consumption and allows for an electric car in the future, while an evacuated tube solar hot water system increases solar collection and induction cooking reduces emissions. “Solar and raintanks also make you feel more in touch with nature because it’s in your interests as to whether it rains or shines,” Julie says. 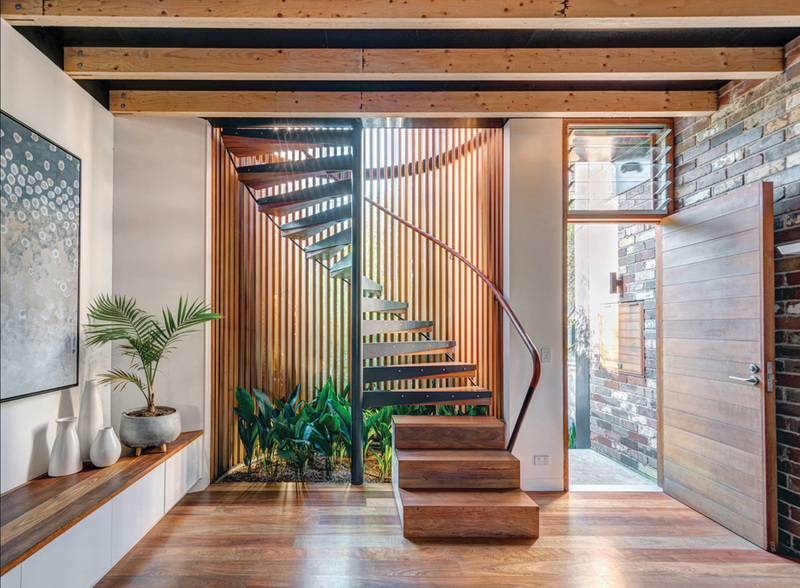 At the front of the house a spiral staircase rises over an indoor garden and is enclosed by glazing for natural light and timber battens for privacy. Upstairs, an open space serves as another living area and guest bedroom when needed. The first floor is also configured around the central garden with the bathroom, study and bedroom positioned along its three sides; and similar to downstairs, glass windows and louvres dissolve the rigidity of rooms and provide for natural light, ventilation and the sense of openness. The modest material palette showcases the detailing and craftsmanship. 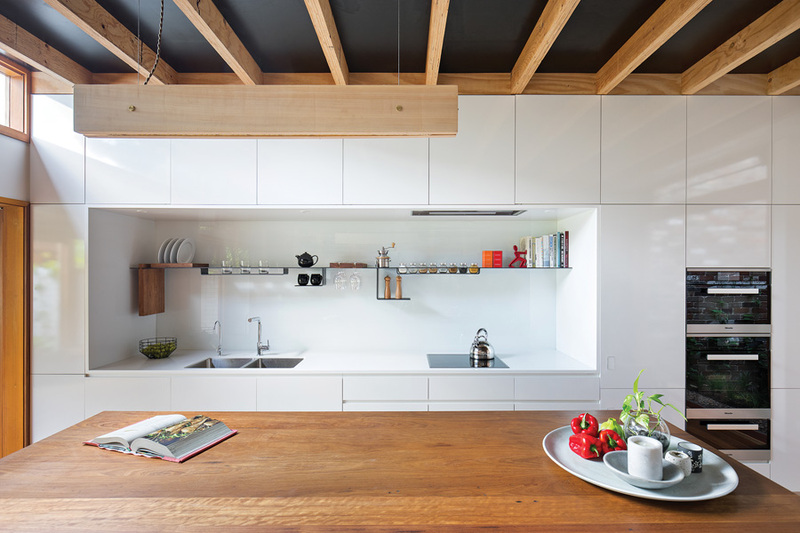 In the kitchen, the laminated veneer lumber structure is exposed against the black formply ceiling; floors and tabletops are spotted gum; and window and doorframes western red cedar. A skin of recycled brickwork conceals the original walls of the house, and shiplap cladding enhances the pitched profile of the ceiling. 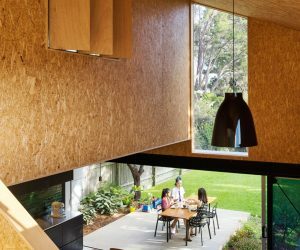 A house with such sustainability initiatives requires active engagement while its flexible spaces provide for greater choice and utilisation. Both, however, contribute to a more functional, longlasting and high performing home with ideas and features that will inspire future creative outcomes. As a terrace house on a tight urban site, opportunities to optimise solar orientation for passive design were somewhat limited. To increase the natural light available to the ground floor, an internal courtyard was incorporated into the design. This had a secondary benefit of improving natural ventilation and cooling throughout the house. 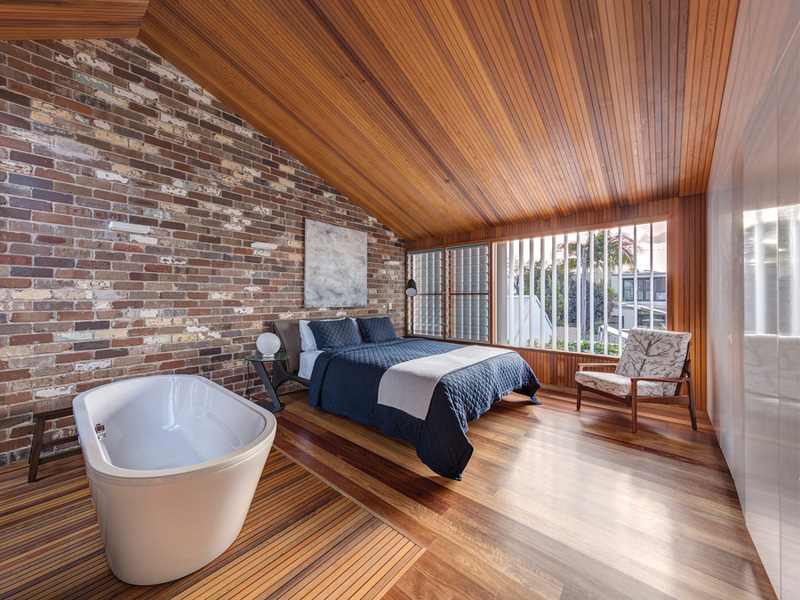 Timber (spotted gum, western red cedar and blackbutt) and recycled bricks (from The Brick Pit) are the dominant materials, contrasting with joinery in a white finish. The timber beams have been left expressed internally. The flooring throughout is 90 mm tongue and groove spotted gum on batten above a concrete slab (ground floor) or suspended timber floor (first floor). 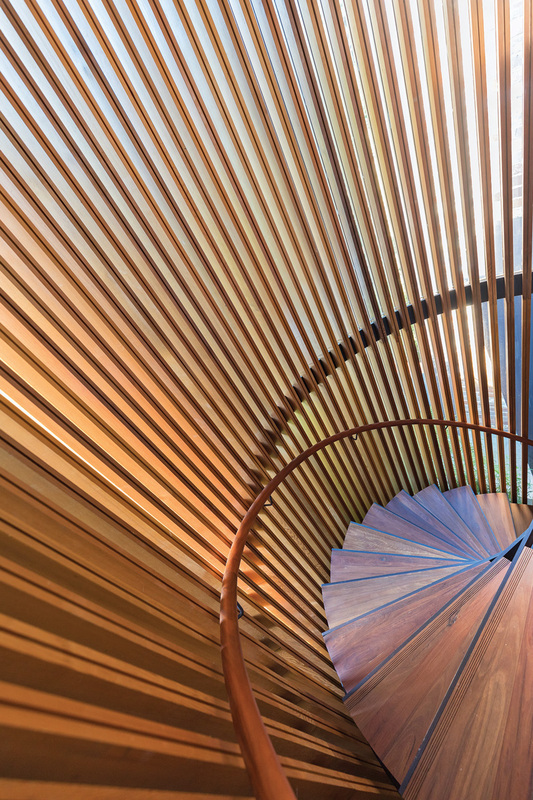 The custom stairs use recycled blackbutt treads. All doors and windows are western red cedar timber-framed, supplied by Windoor. A mixture of 3.68 mm fixed-glazing and “Breezeway” louvre are used in the home. The western façade is protected by aluminum fins. Given the western orientation of the rear yard and the clients’ desire to blend the indoor and outdoor spaces, addressing solar heat gain on the western façade in summer was critical to the success of the project. To address this, external shading was provided to the bedroom (Maxim Operable fins) and the pergola provides shading at ground level. Highlight window above the rear pergola enables winter sun to penetrate. The internal courtyard provides additional light without a minor impact to overall heat gain. Hot water is provided by a 250L solar evacuated tube system with electric boost supplied by SmartHeat. 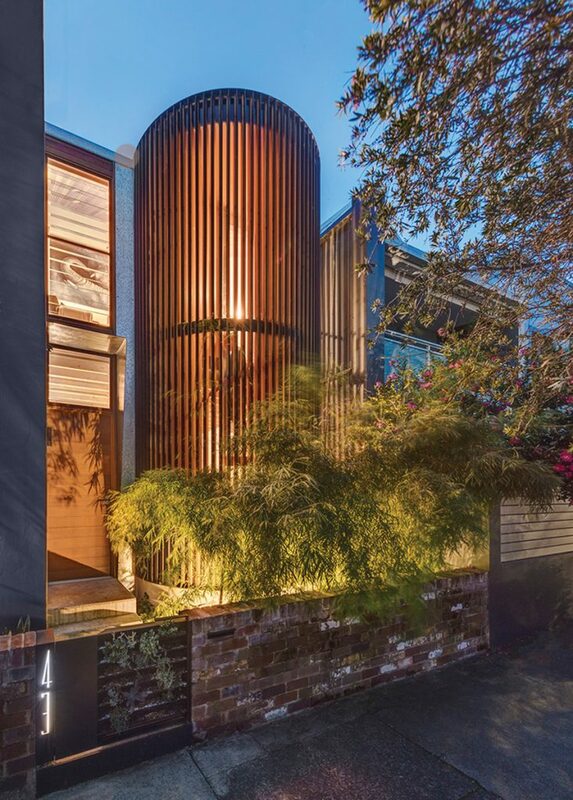 Water from the roof is harvested via a rain chain in the internal courtyard and directed to 5000L Tankmasta Bagel underground tank installed at the rear with a trafficable lid. A first flush diverter is also in place. Due to the local rainfall patterns, there was negligible benefit to installing a larger tank. Rainwater is reused in the laundry as well as forming part of the aquaponic system. 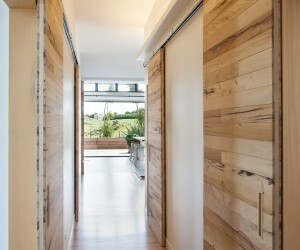 The house is designed to have a low overall footprint. From the kitchen, scraps go to the chickens and worm farm. Both produce fertiliser that is used on the vegetable garden, which is supported by a wicking bed. 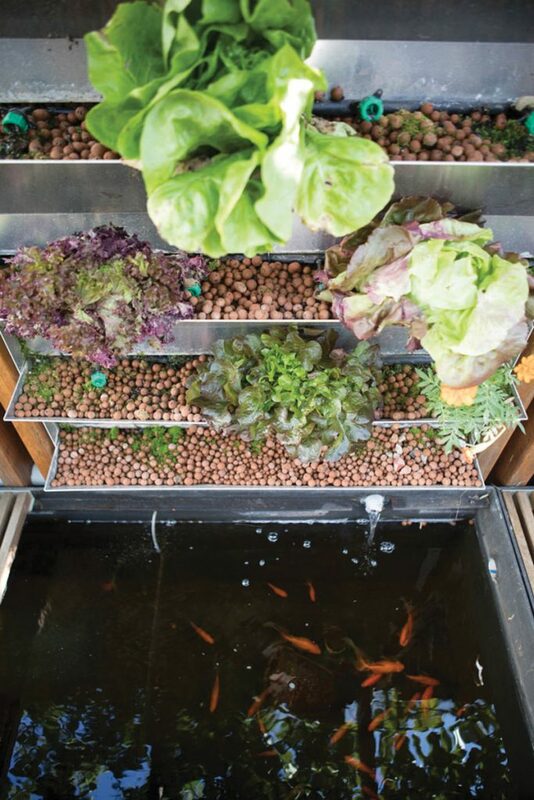 An aquaponic system uses the nutrients from a productive fish pond to fertilise a hanging herb garden, which is harvested for food. At present, the household disposes of excess food to neighbours. The house uses low-energy LED lighting throughout the house, supplemented by a poplar plank light in the kitchen. A 1.5kW grid connected solar power system was installed. Electrical rough-in to support the future installation of a battery and a charging point for a future electric car was also incorporated in the project.